A single song from this stunning 2015 release Music, When Soft Voices Die was introduced to me at a music presentation which sparked my interest. 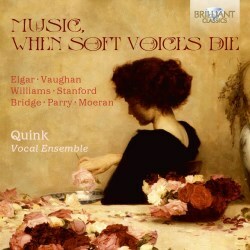 Sung by the Quink vocal quartet I was struck by the stark beauty of Vaughan Williams Silence and Music. Consequently I obtained the album, a captivating selection of twenty-nine English part-songs from the pens of Vaughan Williams, Elgar, Bridge, Stanford, Moeran and Parry. Of course Irishman Stanford was born in Dublin but he spent most of his life in England teaching composition at the Royal College of Music (RCM), London. All the composers, bar the self-taught Elgar, are strongly connected to the RCM either as teachers, pupils or in Vaughan Williams’ case both. A Shelley setting the title song Music, When Soft Voices Die appears in two versions one each from Bridge and Parry. Founded in 1978 the mixed vocal quartet Quink from The Netherlands is the recipient of several awards for its albums singing repertoire that spans over five hundred years. Here on Brilliant Classics the vocal ensemble has turned its attention to the rich trove of unaccompanied part-songs from the late 19th and early 20th century English music tradition. This is a judiciously chosen collection of part-songs from six composers with every song worthy of inclusion. My particular favourites include Elgar’s Love an Arthur Maquarie setting given a haunting quality by Quink. With words by Longfellow the captivating O weary hearts by Bridge is given a deeply emotional rendition and Autumn a Shelley setting also by Bridge strongly evokes the colour palette of the season. Vaughan Williams’s wonderful Silence and Music to text by the composer’s second wife Ursula Wood with its sense of bleak and poignant impression that feels almost uncomfortable in its effect is sung with intense focus. Worthy of praise too is Vaughan Williams’s Sweet Day a George Herbert setting affectingly sung with rapt tenderness. Impeccable diction and agreeably precise intonation are hallmarks of these striking performances by Quink but accuracy never comes at the expense of colourful expression. It really is hard to imagine this collection being sung better. Recorded at Sint Martuskerk, Amersfort the sound quality is first class, clear with good presence and beautifully balanced. There is a helpful, uncredited essay in the booklet and I am pleased to report full English song texts are included. This is a captivating album of English part-songs gloriously sung and recorded which is self-recommending.